The JV1080 was a great then we got the JV2080 that was better next we got the XV5080 that was better, so now we got the DVD for all of them. We cover setup with all the cable connections, MIDI, audio, and power, editing sounds, Patch edit to get the sound you want with 128 voices; 32-part multitimbral operation, Rhythm Patch edit, setup sound for specific MIDI channels, adding effect to any sound and mapping to use multiple effects with it's 5 effects processors, we even setup an MPC1000 and a Korg triton and do a little song to show you how to use it right. The XV-5080 organizes its internal Patches into 37 categories like keyboards, organs, strings, synthesis, and so on, you can even add sound with their extremely expandability with room for 8 sound cartridges from the JV-80 series, as well as a data card slot. . A big orange button on the front panel lets you access the popular Patch Finder feature introduced in the JV-2080. 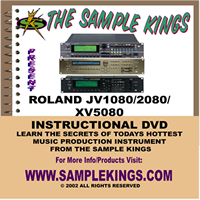 You'll learn how to use any feature on any on of these classic modules from Roland.with this video get the download or the DVD and get to know these modules from Roland. 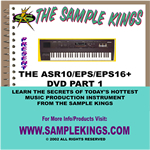 This DVD is To ORDER with YOUR CREDIT CARD ONLINE Click here.